Artists are perceived as being, shall we say, a bit out of the ordinary. Maybe a little crazy, or just plain nuts. I have this new painting. Anyone with any sense might have painted ONE flamingo. But in a painting that is 7 inches by 10 inches, I painted something like 70! 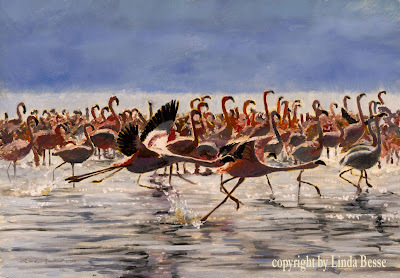 What was I saying in the last blog about painting too many birds? Still this was a lot of fun and I have to say one of my favorite small paintings. If every artist knew when to stop painting, artists would know better how to begin. How often do we artists noodle a painting? Putting in detail that doesn't need to be there. Fussing with the edges. Thinking there needs to be one more bird when there should be two less. Changing a simple dramatic scene into something complex and ultimately.... boring. I am not immune. So, I do try to think like an editor. Does that story line really add to the plot? 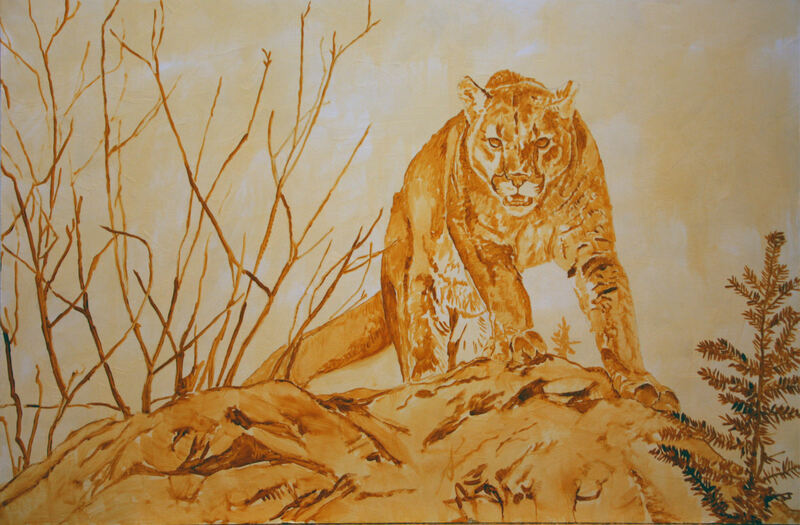 If my painting were someone else's painting (helps me to think critically if it is not mine), what would I take out? Some of this thinking came into play with the sticks. Should I have more? less? should the line go to the left or right? Should I cover up all the background wash? (I decided to leave some showing.) You may not agree with all my choices on this painting. Many are subjective. Artists of all levels may have chosen differently. In the end, this painting says what I wanted it to say. I feel what I wanted to feel. And hopefully, I knew when to stop. I meant to post in stages as I worked on the cougar, but I was so in to the painting that it wasn't until I was finished with him that I realized I hadn't taken a single photo for you. Rocks used to be one of my least favorite things to paint. My knowledge of rocks exceeded my painting skill by a fair margin. A downside of having an M.S. degree in geology. I knew when rocks didn't look "right", but had a hard time "fixing" them. Once I decided to approach them as I would any other subject matter, painting rocks became easier for me. Still, almost every time I paint them, I soon get to the muddy section when they look like nothing. That is when I need to step back, formulate a strategy and attack each section slowly, working on it until it looks rocky. I hit that muddy stage in this painting once I had blocked in all the color. The metamorphic nature of the rock just wasn't coming through. Step back, deep breath. Let's start on the lower right section and build up from there. 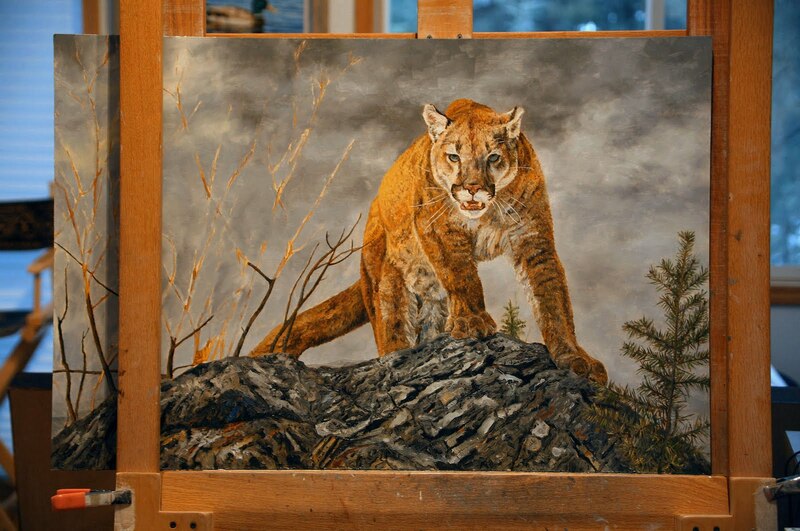 Below you can see the rock basically done although there will be some tweaking as I continue the painting. 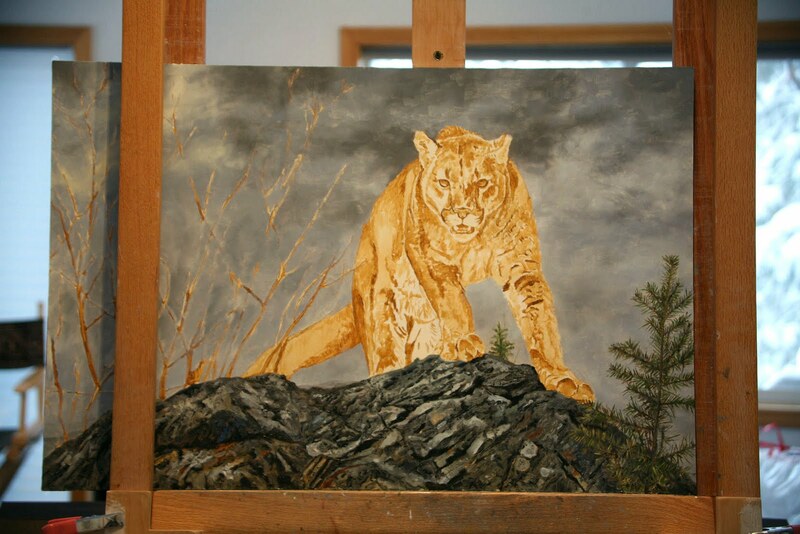 It has been a little while since I have posted a painting in progress. So, here is my latest. I had a great cougar reference photo which I took. Often I have to use 5, 10, even 15 reference photos which I have taken to build a painting, but this one was just about perfect. I loved his body position and the perspective, but there were a number of issues which despite the pluses above, made the image a bit dull. While his body had a dramatic pose, the head was down. This would not necessarily be a bad thing, but in this case, the lowered head lowered the drama. The mouth was funny. His eyes almost looked cross-eyed. The sky was boring. The lighting...not very exciting. My plan: raise the head, fix the mouth, set the eyes on the viewer, have dramatic light on his side, have a dark stormy background. Once the drawing was completed it was time for the next stage. 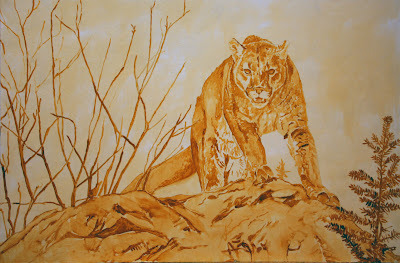 Here I have done a raw sienna/burnt sienna turpentine value wash. The wash on the cougar doesn't speak to the dramatic lighting I envision. Once I start using color, I will play with the lighting. I want his right side (what we see on the left) to be hit with sunlight. Also, I haven't played with any sky detail during this stage. As I start painting, I am thinking of the light hitting the cougar's side. It has to have a source (upper left) and for more drama, I want a dark sky to touch him on that side. 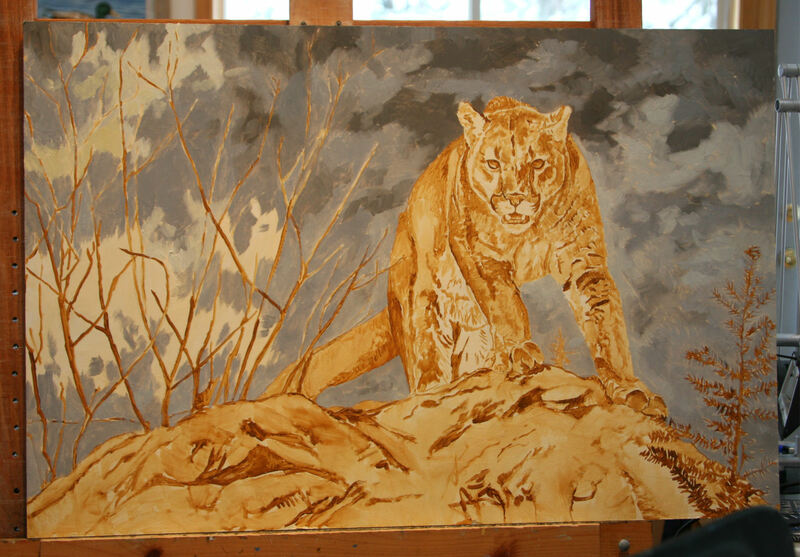 Here, I am just adding paint and will blend once the paint is blocked in. As an interesting note, I still have the same blending brush from my very first paintings.....ever. The brush bristles are in fine shape even though there are very few paintings in which I have not used it. Granted, the paint on the handle has seen better days. Like many artists, my painting ideas may germinate for a long time. Sometimes days, but more often months or years. 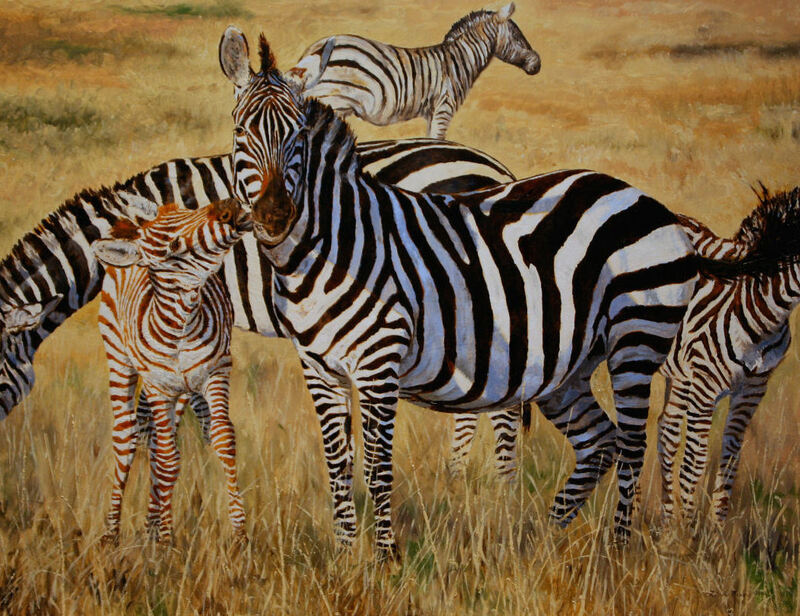 As soon as I saw this little zebra colt in 2007, I knew I had to paint him. His bright orange coat and his gesture toward his mom was a scene that haunted me, in a good way. But the right time didn't materialize and I hadn't quite figured out how I wanted to paint them. Once I came up with a more square format, the composition came into focus for me. 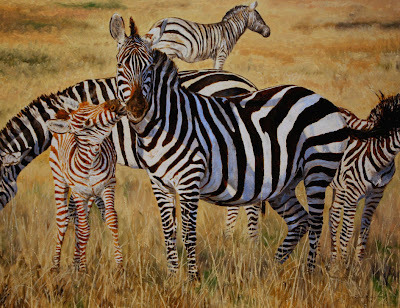 I wanted other zebra in the scene but no complete zebra except for the mom and colt. Including the loose background zebra seemed to help with the square format. 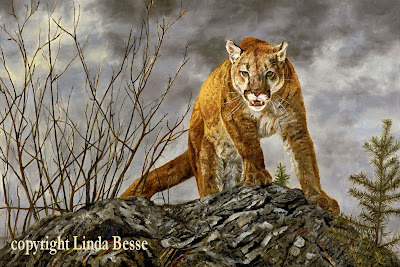 While painting the scene, the title eluded me. It finally materialized with my last brush stroke. Stay more current on my blog. To top off a wonderful Holiday Season, snow blanketed Spokane. It started as rain then turned into a magnificent storm dropping more than 10 inches. The rain actually enhanced its beauty. By coating the trees first with ice, the snow landed on a "prepared" surface. It is almost a week after the storm and thanks to sub-zero temperatures, the picture perfect landscape remains. If I painted it without showing it to you, you'd never believe it. So, as proof, here are two of the more mundane photos of my side yard. You should see it when the sun comes out!! !